This remarkable study of Auschwitz is unlike anything yet published. Though it is purposely small in size and easy to read, it carries a powerful punch. The author visited Auschwitz as a tourist armed with a broad study of the literature surrounding the world-famous site, and from that visit has proceeded to deconstruct the Auschwitz shown to her and others as a “death” or “extermination” camp. 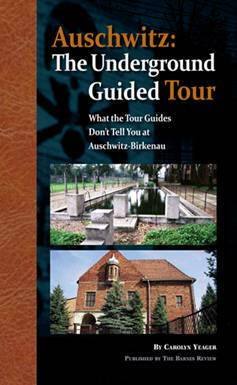 By taking the reader on an “underground guided tour” around Auschwitz-Birkenau, she clearly demonstrates it to be, at varying times and locations within the perimeters, a simple labor, concentration and transit camp for political prisoners, where the health of the inmates was a prime concern of the camp authorities. Sound unbelievable? After reading this carefully researched book, you will see the horror stories for so long spread about Auschwitz-Birkenau in a new, more skeptical, light, and you may very well be so impressed you’ll want to share your new vision with others. A cautiously written work that moves toward a surprising conclusion, leaving us pondering how so much that is not true has seeped into our consciousness as “fact.” Lavishly illustrated.